A page for occasional notes on specific events to give some insight into how Ruth developed the work. Clicking on 'UPDATES' at the top of the page will open a series of further pieces written about current collections in exhibitions. 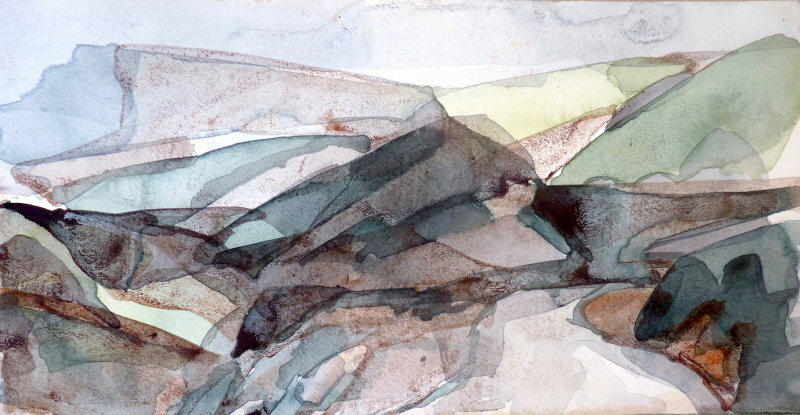 This first piece recalls the shapes and colours of a 1960's landscape still affected by slag heaps, but showing in the distance, the light sunny forms of hillsides unaffected by the grime. Living in West Yorkshire allowed weekend visits to Holmfirth and onto the Pennine Moors, a landscape which Ruth feels is her spiritual home. 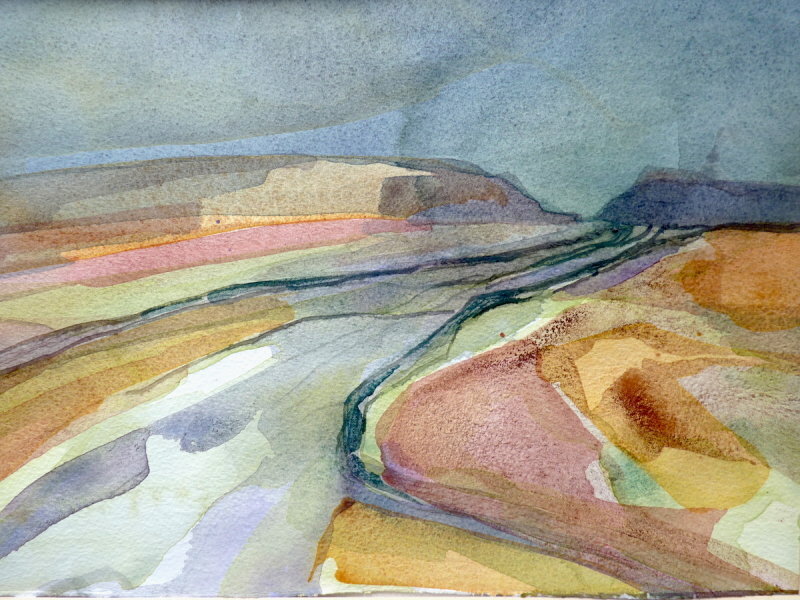 Her watercolour work is made with only a mental recollection of place and form. She may have sketched in situ, but in the studio a kind of distillation happens and the first layers of colour which go down seem to be made with no conscious sense of planned or realistic representation, laying down forms which most impressed upon her when in the place. 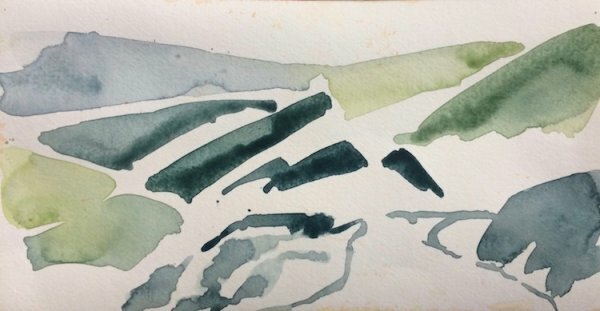 In the piece below, scratching the surface of the wet, heavyweight watercolour paper introduced some interesting suggestions of the kind of wiry detritus and abandoned buildings sometimes encountered walking through hills which once supported mining and weaving. This demonstrate that Ruth sometimes chooses to leave layers of translucent pigment to dry before choosing the next colour, always looking out for those serendipitous, unplanned shapes. Sometimes she will work a drying edge of paint with water or a different wash, and watch to see how the capillary action affects the flow of paint over the surface. Granulation typical of certain pigments also adds to the composition. The final piece is always the result of choices made as she goes along, choices made simply on the basis of what is pleasing to look at. These examples from the Kunsthuis collection give a sense of quiet, so by contrast this following piece presents power and dynamism in its composition. 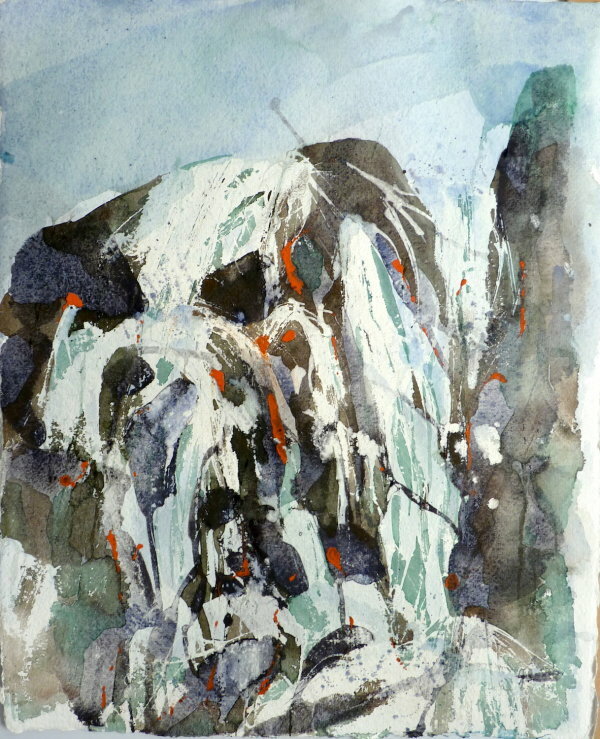 Entitled "Water Falling", its one of several paintings inspired by a walk through the towering rocks and pounding falls of Ingleton Gorge. Its a large piece painted on Ruth's favourite paper: Two Rivers paper Company's 700lb NOT. "Quite a beast to tame, but wonderful stuff" she says.